Surgical hip dislocation is a procedure in which the hip is dislocated to allow better access and visualization of the articulating surfaces of the joint. It is used to treat abnormalities such as bony overgrowths, cartilage wear-and-tear, labral tears and synovitis (inflammation of the joint membrane) that cause pain and affect movement. Though these conditions may also be treated by arthroscopy, a minimally invasive procedure associated with faster healing, hip dislocation allows the articulating surfaces to be more precisely reshaped and immediately assessed for improved outcomes in hip movement. 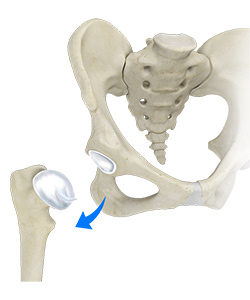 Surgical hip dislocation is performed under general anesthesia. Your surgeon makes an incision along the side of your hip. The upper part (greater trochanter) of your thigh bone (femur) is cut to allow access to the joint without incising much muscle tissue. Arteries and nerves are carefully identified and protected. The bones are then disjointed and the articular surfaces treated. After re-articulating the bones, the cut part of the femur is replaced and fixed with screws. The incision is covered with a gauze dressing. The entire procedure takes about 2-3 hours. Ice is applied to control pain and swelling for which your doctor also prescribes medication. You are placed on crutches for about 6 weeks.